The knowledge of reflex diagrams combined with the use of multireflexology tools produces excellent results for facial beauty. 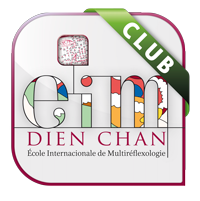 Dien Chan brings a therapeutic dimension to beauty treatments. 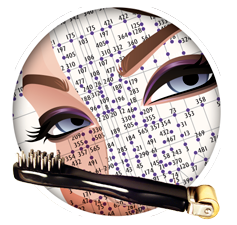 FACEASiT provides instructions for using the diagrams of reflex points on the face and the list of recommended tools. On the carousel on the right, the tools most used in beauty treatments are highlighted. 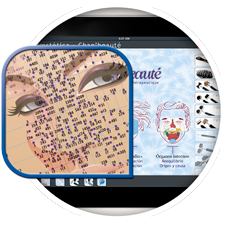 The fact file for each tool contains directions for use in Chan’beauté. For more information about Chan’beauté, please visit the official website: www.chanbeaute.es. If you’d like to enhance the combined yin and yang effects of the multireflexology tools, we offer the comprehensive beauty kits and bio essential oils (AB certification) of the Institut d’aromathérapie Marie-France Pierre in Belgium. Our specialists recommend specific treatments for each problem. The full range, plus lots of tips and hints, is available at chanbeaute.es.